When I was at UCLA I had the notion that I would study something I loved, Literature, and would balance it with another less appealing but would maybe-pay-the-bills sort of major…like Economics. Needless to say, I didn’t last very long as a double major in Literature and Economics. I did stick around long enough in Econ 101 to learn about something called “transaction opportunity costs.” I learned that an transaction opportunity cost is the incurred cost of making an exchange. Aside from the nominal price of what you buy, there are the hidden costs of production, distribution, etc., Blahblahblah. Another broader and more symbolic way to look at a transactionopportunity cost is that when you choose to do something, you simultaneously choose NOT to do other things. WIth our launch date ever inching closer (4 DAYS!!!) this concept keeps popping up in my head. Last night, Laura and I went to our last happy hour with our friends. Now, this isn’t any regular happy hour. It has been a tradition of 5 years that every Friday we would all meet at (4 to 16 people…the happy hour would expand and contract during the evening) around 6:30pm, have a few beers and decompress. 5 YEARS! Every week with only a few exceptions. For many of us, this was the most regularly scheduled and attended thing we did. It was a real life Facebook every Friday. 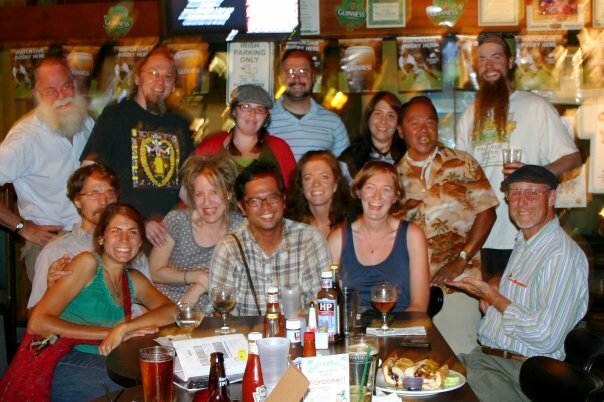 Last night was our last happy hour with our friends here in Long Beach. While there was still laughs, there was also an undercurrent of sadness as we all knew that this configuration of friends was going to change. Happy hour will no doubt go on without us but this era where we were present has come to an end. Last night has been the saddest so far for me (which will probably be out-saddened by our farewell party on Wednesday) and that is when this whole idea of transaction opportunity cost popped into my head again. This Friday happy hour, this group of friends that we’ve grown close to over the years is our biggest cost. Leaving them for a while and all the sadness that it entails is part of the price we pay to go on our adventure. I understand the flip side as well, that the world is ours to explore, but losing this warm cozy nest, our support group is a deep debt that we will always feel. For me, it has also been the most difficult aspect of going away. So we raise our glasses once more to you, our happy hour friends, whose lives have been so intertwined with our own. While we won’t be present, you can bet that every Friday at 6:30pm our glasses will be tilt towards Long Beach. okay, i cried a little. we will miss you guys. This post inspired me to submit an entry to your twitter contest. Best of luck in your endeavors. 🙂 No good-byes only until next time. Cheers! @pathlesspedaled They had found the answer he said/A bicycle had made it clear/The secret to life wasn’t money, it was food, people, & beer. been checking out your posts for the past couple wks. just wanted to, “Raise my Glass” to the both of you on the cusp of starting your journey. looking forward to your plight updates.